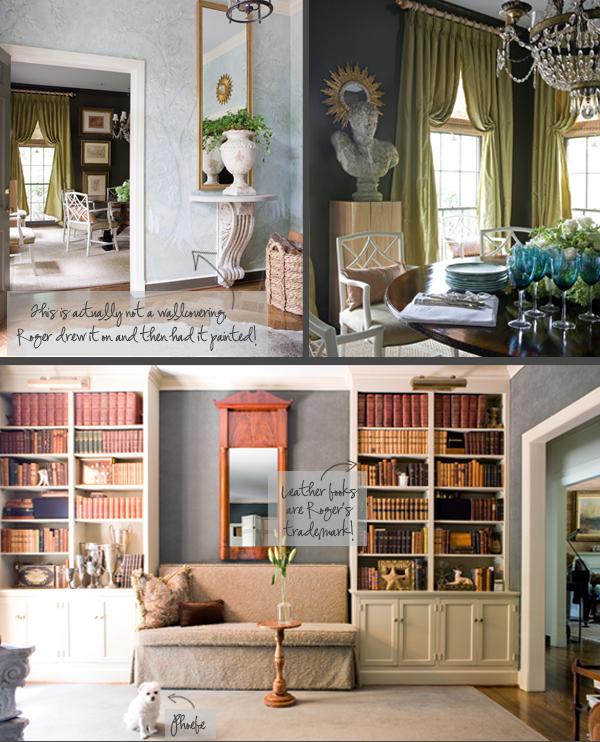 Welcome to the home of Roger Higgins and Ann Shipp (the owners of R. Higgins Interiors). People are always trying to get a glimpse inside of an interior designers’ personal space, so we thought you might enjoy taking a tour of their eclectic house. Designing for others has always come natural to the pair, but it’s in their own surroundings that you truly see their passion for beautiful interiors come to life. From your first step inside the door, you understand the uniqueness of the space with its hand painted wall design (that Roger sketched on the wall himself) and the collaboration of old and new accents. One point that Roger stresses for furnishing your home is that all objects need not be precious. In fact, it’s the incorporation of less expensive market finds that balance your aesthetic and enhance the finer pieces. Making your way into the dining room, a sense of balance continues to be featured in the design. The bold chartreuse draperies against the high gloss charcoal walls add a sense of deep contrast. Also, the chairs which were purchased at an auction and then painted a crisp white for a more contemporary look parallel nicely with the more traditional table. Leather books are not only a signature item in our showroom, but they are also our go-to accessory for any space that is lacking warmth or texture. Their classic form can transform an empty tabletop or shelf to an interesting visual element. 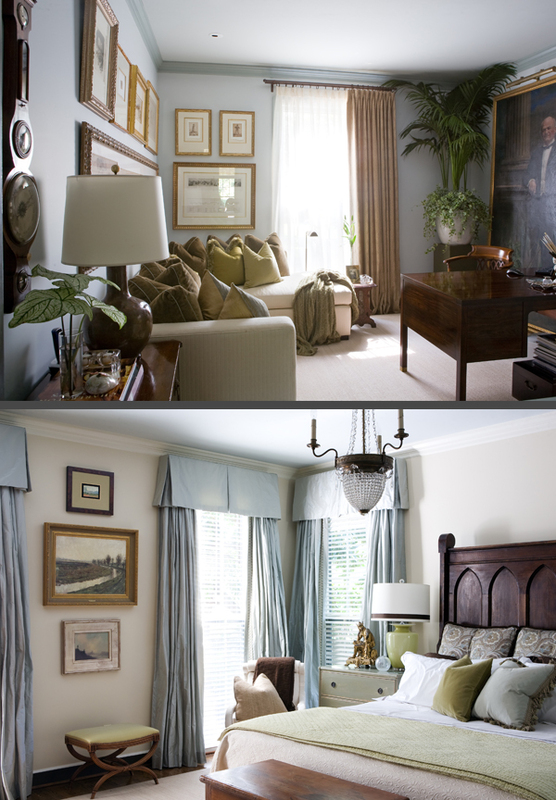 Pictured above is the study and the bedroom. Both spaces along with their kitchen (shown below) convey a relaxed setting. The cool color pallette offers a calm background for the heaviness of the desk and the rich headboard. In the kitchen, they’ve used a tile backsplash with matching Venetino Marble countertops to complement the neutral cabinets. Need a solution for unattractive panelled walls? Upholster them. The designers used dark green billiard cloth to conceal the old barnwood paneling that existed before the resourceful couple moved in. 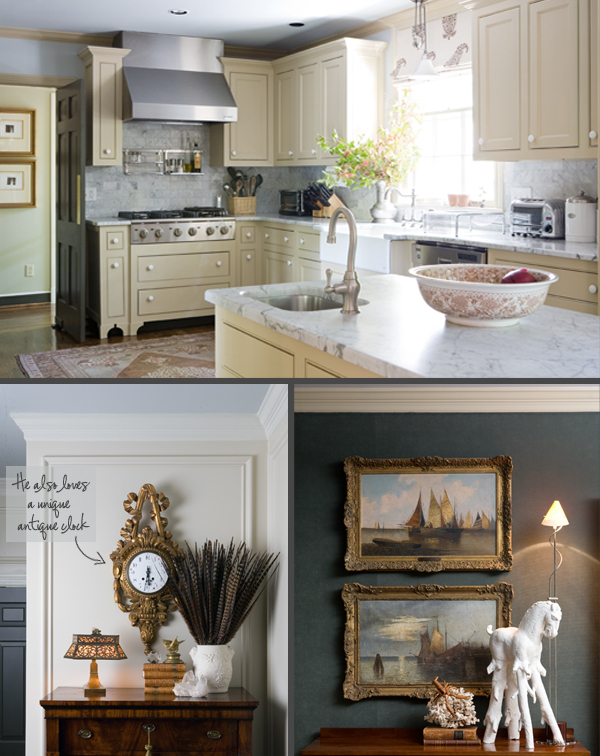 Complete with antiques and some pieces that Roger lovingly refers to as “junk,” the home is adorned with items that reflect their refined style and eccentric personalities. It’s one-of-a-kind atmosphere stems from years of collecting accessories from all over the world and layering them in unexpected ways. Mixing styles is also key to interpretting Roger and Ann’s personal design attitude. Sticking to furniture from all one era can be limiting and boring, so get out of your comfort zone and try something new! Your home is so beautiful! Thank you for sharing. I just discovered your beautiful website and lovely blog. I am looking forward to keeping up with your projects.